Discussion in 'Marketplace' started by Alexi, Nov 25, 2018. 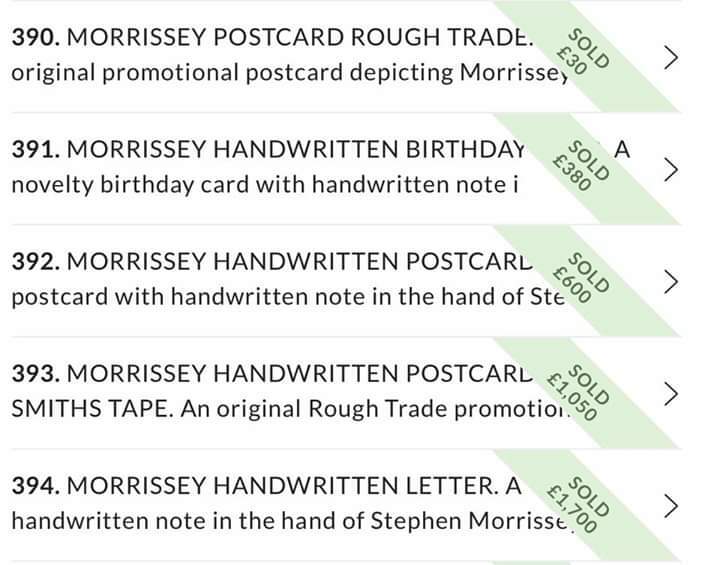 There is also a handwritten letter from Morrissey to Liz - who designed T-shirts and artwork for The Smiths - detailing the travails of fame. Morrissey, wrote the note in 1983, as the band began their rise and began: "Naturally I contract some unnamed fatal illness seconds after we hit the road. I don't time my diseases very well do I." He adds, sarcastically, "I can't thank you enough for sending me the begging letters, they are getting WORSE. One began 'Dear Morrissey please write me a song about losing someone you love'. " I'm having a cup of coffee now. He should have gone for "influenza" in the letter. But funny that he lined it out, and went for the less extreme, "illness." That is what is at the heart of Morrissey's sense of humor. The life and death stakes. Never just sick, but on his death bed... Basically, what makes his lyrics with The Smiths so remarkable, and hilarious. And then, with a fling, he tosses it away. "Girlfriend in a coma, I know, I know, it's serious..."
I like the graphics on the T-shirt. 'He adds, sarcastically, "I can't thank you enough for sending me the begging letters, they are getting WORSE. One began 'Dear Morrissey please write me a song about losing someone you love'. " 83 ? this might be around the time he wrote the lyrics to 'I know very well how I got my name'. Did he put the lyrics in a drawer for five years? yeah, some in the drawer, some in a boot, 5 year, six years, ten years old !. He's still writing variations on that theme, what's wrong with that? Who dyed his hair gold' Unfortunately when trying to dye his hair gold it turned green instead ! Or was it purple ? This shirt is so rare, I thought I'd never see another one , but in the U.K , I think you can find anything related to smiths or Morrissey. Sometimes I wished I lived in U.K, for that reason....but not very often. I don’t get Bowie. Like a handful of the songs but the lyrics are appalling. The tunes are good so he mostly carries it off but was a clever charlatan. Liked young girls too. He also inspired a lot of duffers to pen even more rubbish lyrics. Black Star was diabolical. The handwritten letters are part of this weeks auctions at Omega. Oh is there more than the one? Where are the others? Happy times! (contrary to popular opinion). Great to get an update on Liz. Just to jog her memory, I can testify she also made white T-shirts with the daffodil logo. They were advertised briefly in the NME for £4 when Liz was living in Portland Street. Mine was addressed to "The Very Handsome" ... and yes, I still have it intact! (the T-shirt, that is). Some people don’t get Bowie,that’s alright. Maybe next time around. I wonder if Susan Jacobs is the high bidder of the letter? Some great prices being paid - worth a look. (Apologies about the ugly URL).